4 Top Self Tanners to Try! Home Beauty Buzz 4 Top Self-Tanners To Try! It is that precarious time of year when temperatures instantly soar and everyone seems to be ready to soak up the rays… except for a few of us weekend workaholics who are bringing home the bacon and therefore don’t have time to hang poolside or at a lovely outdoor venue feeling the heat. So if any of you out there are like me and you a)haven’t had a chance to get your tan on, or b) are skipping the sun to avoid damaging rays here are some tips on finding a good self- tanner and some great ones to try! If you are worried about an orangey look be sure to check the label. The orange color is usually caused by too much DHA (dihydroxyacetone) a colorless sugar that interacts with the skin to give it the darker color. But these ingredients react differently on everyone so be sure to do a test patch before applying product all over the face or body. Reputable brands often have a better balance of DHA and often will create a better color on the skin. And don’t forget to exfoliate prior to your self- tanning session to create the most even color. For a rich realistic tan I love St Tropez brand of tanners, they add a hint of green to the formula to counteract any orangey tones. 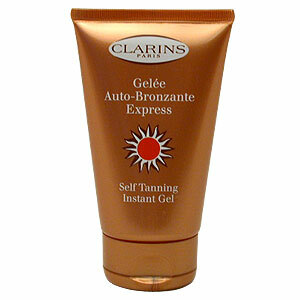 Their Self-Tan Bronzing Mousse is a lightweight, velvety formula that glides on smoothly, looks gorgeous and smells good! Because I am always in a hurry I love a no fuss tan towelette. Not only do they take the guesswork out of applying the products but they are quick, easy and don’t make a mess. Two of my favorites are ModelCo Tan Tanning Glove which if not used all up with the first application can be strategically resealed and used again. 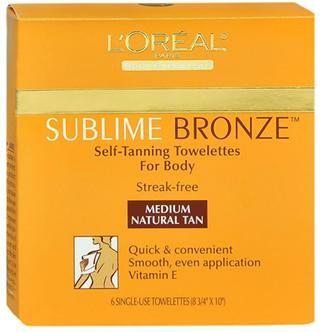 Or for more budget conscious tanners L’Oreal Sublime Bronze offers a great color and the same ease of application as the ModelCo gloves…and if you don’t mind that chemical smell you will like these.